Hugo Jennings in Editor's Picks Music on 26 May, 2017. 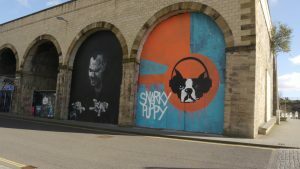 A lot has changed since Snarky Puppy last made it to Gateshead in 2014; not least that they are now such a well-known force that they commanded enough of an audience to perform in the glorious “Sage One” concert hall. At the very beginning of proceedings on the 3rd May, the leader of the group, Michael League, made a remark about how quiet the audience were in anticipation of the acts performing that night, suggesting that the concert hall experience was new even to a group as successful as his. It was not long, however, before the audience were compelled to behave more accordingly to the traditional “gig” proceedings, as the performances of both House of Waters and Snarky Puppy were worthy of raising the architecturally-astounding roof of The Sage. House of Waters, the introductory group for that night’s performance, are probably one of the most unique groups you will ever come across. It will not be long before they are well-known outside of the manufactured world of the charts. Made up of Max ZT, Moto Fukushima and Ignacio Rivas Bixia, I can only describe their sound as being a sound which one has longed to hear without truly realising it. Their combination of musical styles from throughout the world, ranging from Senegalese to Indian to Argentine melodies and rhythms, is a sight to behold. One element of the group that instantly arouses one’s curiosity is the unique combination of instruments they play. Max ZT, a hammered dulcimer player, studied in Senegal and India for many years, in the latter country he learnt about his instrument in the context of the “Santoor”, which has become one of the most prominent instruments in Indian classical music in the last few decades. Fukushima, the bassist, is of Japanese origin but firmly based in the jazz tradition. Rivas Bixia, the drummer, combines his South American feel for rhythm expertly with the rest of the group. Perhaps the most fascinating aspect of the trio’s playing is how well they complement each other. The dulcimer and bassist know almost instinctively when the other is providing the melodic—instead of harmonic—content in the music and vice-versa, suggesting that their rehearsals are frequent and high-quality, while the drummer is always able to provide the right beat and fills to work with their sound. Even the concept of treating a bass as a melodic instrument is certainly different to mainstream groups, but Fukushima’s virtuosic playing leaves no doubt as to his ability to provide the main body of sound. I had the pleasure of speaking to Max ZT at some length during the interval, and he pointed out to me that the fact that Fukushima plays a six-string bass means that he has a higher range on his instrument, meaning that he can provide a low-to-middle melodic and harmonic range. The dulcimer on the other handhas its own middle range which can also add a higher range on top of it. He mentioned how ‘unbelievable’ it was to perform in a space like The Sage—this tour is the group’s first venture together outside of North America—and that it was an ‘honour’ to receive such an opportunity. One suspects that this won’t be their last chance to play to so many people in such an excellent acoustic. When Snarky Puppy last came to The Sage, they were possibly at a peak in terms of their popularity; at least in online terms. Since then, players have come and gone—most notably Cory Henry, whose staggering solo on the track “Lingus” is still mentioned with an air of admiration and jealousy by most jazz and fusion players the world over—but the current crop of players are producing a blend which deserves to be recognised in its own right more than ever. The group, consisted of a meticulous horn section, an inventive group of keyboard and synth players and a mesmerising rhythm section. They played several songs from their latest album, the stunning Culcha Vulcha, as well as some older, more familiar numbers such as “Binky” and “Shofukan”, the latter constituted the final part of the concert, much to the delight of the dedicated fans in the hall. All those present were greatly appreciative, and this seemed to spur on the players to greater heights as they treated their audience to a masterclass in both jazz and rock musicianship. The polished and musical nature of the performance had the audience almost in raptures by the end. What this night in Gateshead proved more than anything is that Snarky Puppy’s level of versatility has continued to improve in the last three years. The number of styles that they have managed to mix together in a way that works well is mightily impressive. If you were to purchase Culcha Vulcha and listen to any two tracks on it you’d most likely find a fusion of at least four or five different styles – they serve as a great example of how researching the numerous ways in which music is played in different cultures can benefit the individual musician. Snarky Puppy’s tour across Europe will continue into June, and they will be joined for some of their journey by House of Waters. Any chance to see either group play is well worth taking; any album of either group is worth listening to.